Maxiflex’s reputation as a purveyor of world-class quality door solutions and services was instrumental in securing an order for an overhead panel sectional door from a leading citrus fruit handling company situated in the Eastern Cape. The customer required a specialised door solution for their new 11 000m2 warehouse with a capacity of handling tons of citrus produce every hour. A superior quality door solution was essential as product handling in and out of the warehouse must be swift to maintain the facility’s interior temperature in order to reduce the risk of costly produce spoilage and losses. Maxiflex offers a comprehensive range of industrial door and loading dock solutions that cater to the diverse requirements of the distribution and logistics industry. 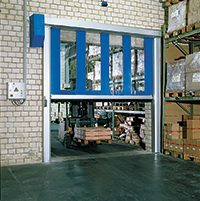 As the exclusive Sub-Sahara Africa distributor of ASSA ABLOY Entrance Systems, Maxiflex’s product portfolio for storage and loading dock applications include docking equipment such as swing lip dock levellers and curtain dock shelters, load-houses, overhead sectional doors, high-speed door systems and PVC strip curtains. The seamless distribution of goods from the source to the final destination requires careful planning and management at the point of loading and offloading. The entry and exit points through which the goods are moved are normally large; alongside the admission of wind, dust, insects and birds, internally controlled hot or cold air escape through these portals driving up electricity bills or causing product damage. Rugged, efficient and reliable door systems are therefore a critical link in the distribution chain. Maxiflex is proud to introduce Stackdoor®, a completely unique and innovative certified security door solution that combines robustness, high safety specifications, efficiency and optimum security in a neat, compact and flexible package. Manufactured in The Netherlands, Stackdoor’s ground-breaking stackable, strong, lightweight construction sets it apart from any other rolling door, security door, open security grille and speed gate currently available in the market. As the name implies, the door stacks rather than rolls, delivering a host of advantages. High-speed door solutions from Maxiflex are cool! High-speed roll-up doors from Maxiflex are helping to maintain constant temperatures inside the cold storage and refrigeration areas of Makro Riversands and Makro Springfield located in Gauteng and Kwazulu-Natal (KZN) respectively. Doors & PVC Strip Curtains: Don’t get left out in the cold this winter! “Allow us to maintain your doors and PVC strip curtains service requirements before winter is here so that you can focus on your core business,” advises Bram Janssen, Managing Director of Door and Loading Dock Solutions specialist, Maxiflex. Door and loading dock solutions specialist, Maxiflex, is proud to introduce the new ASSA ABLOY HS9020GHY high-speed interior door designed specifically for corrosive and humid environments as well as for the food processing industry with its typically stringent hygiene demands. “By effectively keeping out drafts, dust, dirt as well as humidity, these high-speed doors create the necessary hygienic, comfortable and safe working environment and contribute to improved productivity in the workspace,” notes Maxiflex Managing Director, Bram Janssen. It is crucial that fire station doors operate ultra-reliably and efficiently at all times to ensure that in an emergency, fire trucks are able to leave the station without delay. 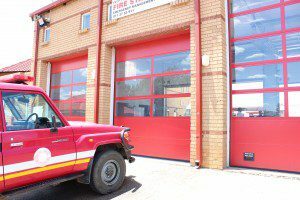 The rugged and attractive OH1042F overhead sectional doors from Maxiflex are defined by all-round efficiency, reliability, convenience and safety making them the products of choice for three Johannesburg fire stations. Maxiflex is a specialist supplier of a comprehensive range of quality, efficient and reliable door and dock loading solutions which includes its renowned in-house Maxiflexbrands as well as the Crawford, Albany and Megadoor high performance industrial doors and loading dock equipment brands under the ASSA ABLOY Entrance Systems banner. Following the installation by Maxiflex of thirteen high-performance doors for a company based in Boksburg on Johannesburg’s East Rand, the customer reports extreme satisfaction with the units stating that production is up and employees are pleased that their work areas are sealed off, preventing the ingress of dust and cold and ensuring a comfortable and safer workplace. 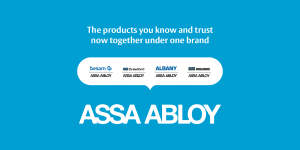 Maxiflex is the sole Sub-Saharan distributor of the renowned ASSA ABLOY Entrance Systems stable of world class quality high-performance industrial doors and loading dock equipment. Outstandingly engineered, the efficient high-performance door series combines excellent functionality with modern design for extremely fast, safe, robust and reliable performance. In addition to improved productivity, end-users also benefit from low operational costs as the doors require minimum maintenance and boast an exceptionally long service life.